This post is an overview of the entire party. I’ll be sharing the details on all the DIY party decorations I made over the next few weeks. 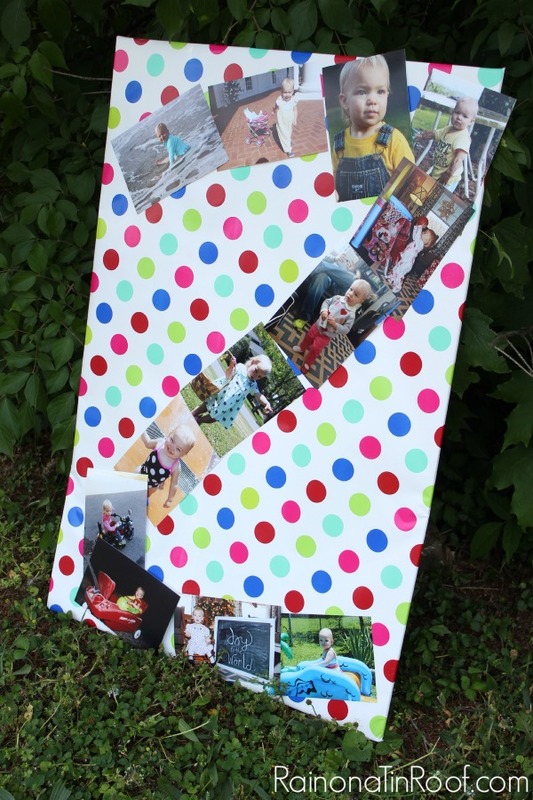 Guests were greeted by a photo collage in the shape of a 2 as they came in the door. Its a little different than our “1” photo collage from last year, but still the same idea. And just in case you didn’t know, the reason for all the rainbows is because in Care-A-Lot, where all the Care Bears live, there are lots of rainbows coming out of clouds. You feel incredibly well-educated all of a sudden, don’t you? Its ok, you can admit it. The dining room was the main attraction. Complete with white cloud balloons and a rainbow made from streamers. 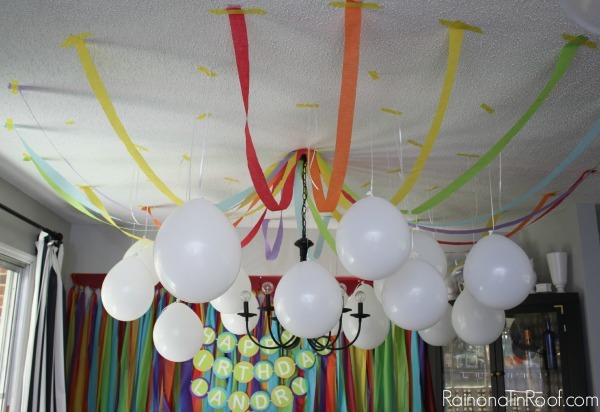 I found that the best thing to attach the balloons and streamers to the ceiling was with masking tape. It held it all up – not one fell – and it didn’t take off too much of the ceiling. I have popcorn ceilings, but you can’t tell where the tape strips were. To make the tape part of the decorations, I used this bright yellow masking tape. 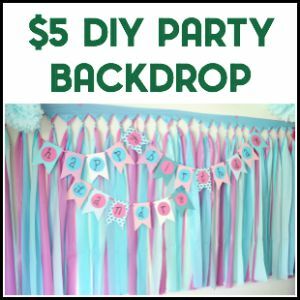 I made another easy party backdrop, but gave it a twist. The details on it are here. I also made the birthday sign, which is different from last years, but still easy. 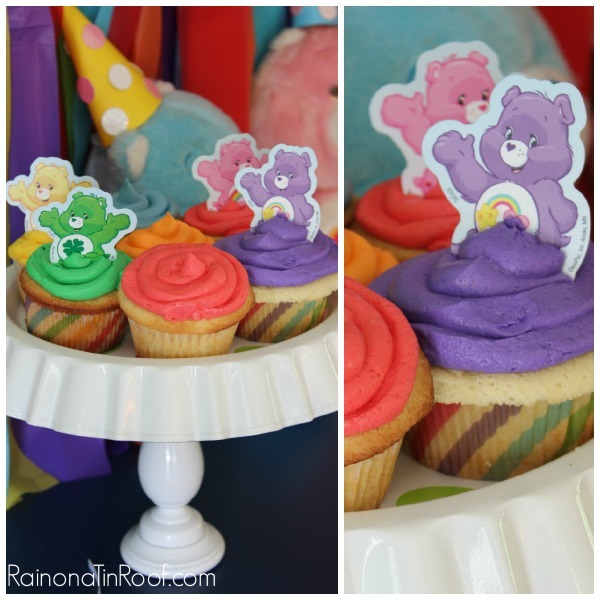 Each one of her Care Bears got their own party hat – you have no idea how difficult it can be to make such a tiny party hat. The DIY cupcake pedestals made another appearance as well. The kid also got a new party hat, complete with bright poms. That party hat worked about as well as last year’s did. 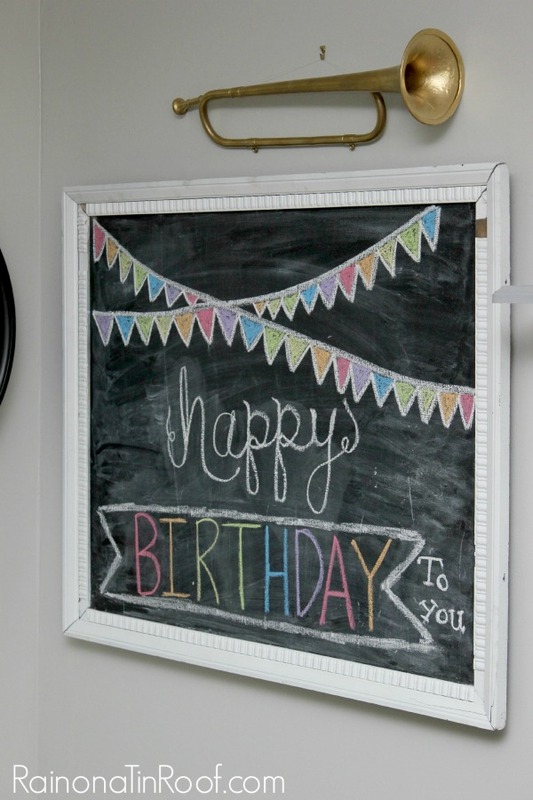 Both chalkboards got a birthday treatment. 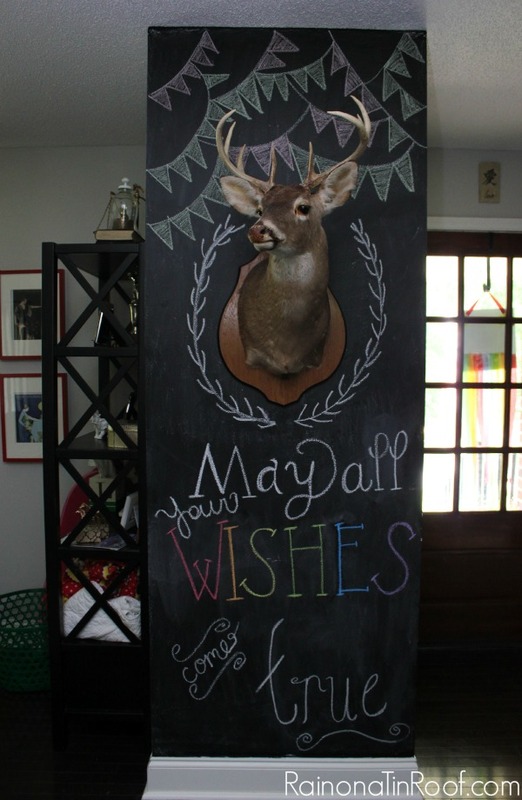 My chalkboard skills are definitely still lacking, but hey I gave it a whirl. I did discover that this colored chalk is my all-time favorite colored chalk. 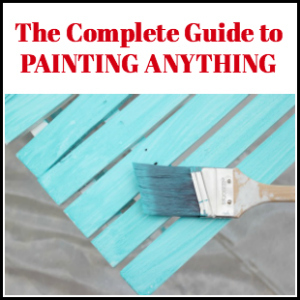 The colors were so vivid – especially helpful in distracting eyes away from my horrible chalk penmanship. And what was the kid’s favorite part of her birthday? The balloons. All she wanted to do after the party and for the following two days was to run around with 12 balloons in her hand. Those balloons took a freedom flight night before last. 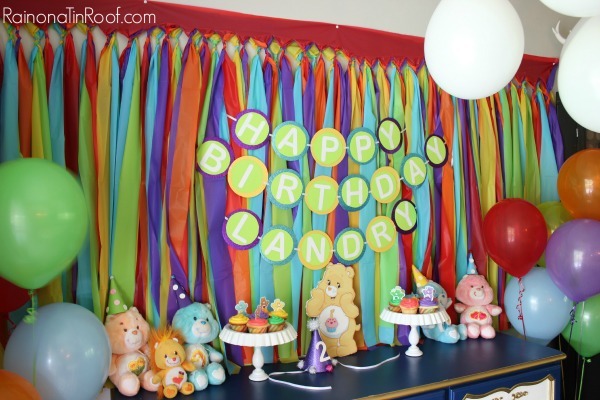 Stick around for the details on all the party decor! 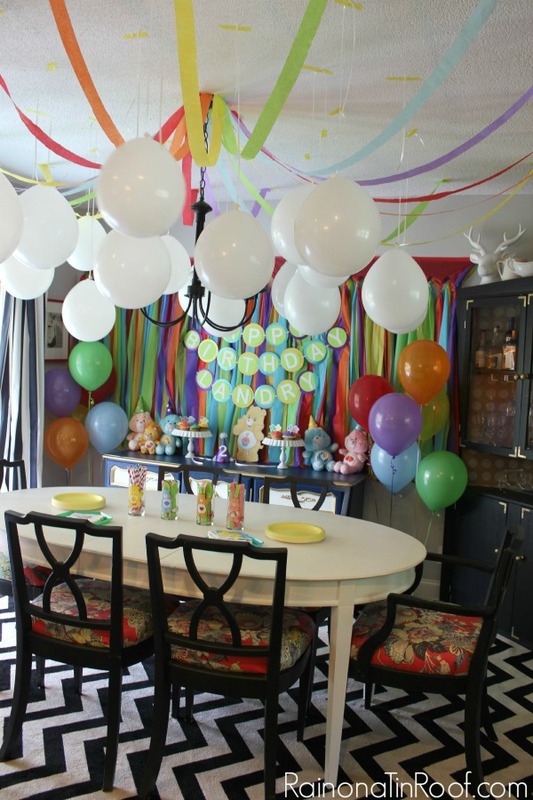 You can see last year’s party and all the DIY party decorations that went along with it here. 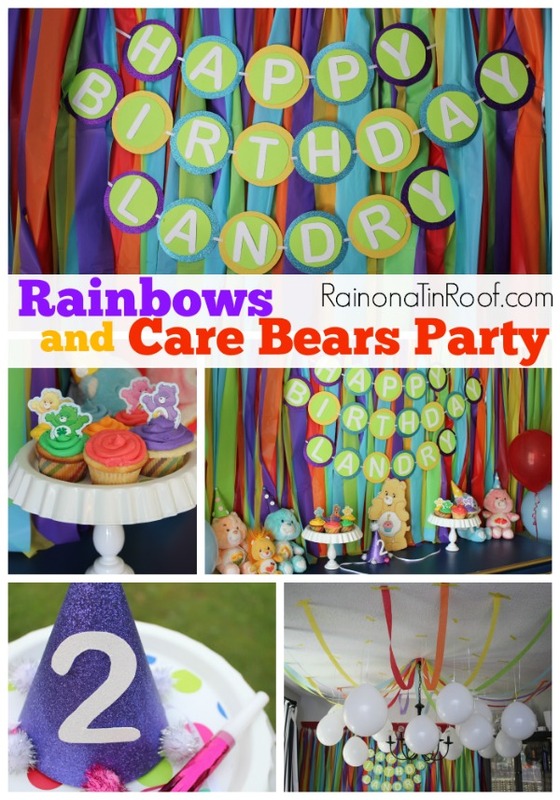 Have you thrown a Care Bear or Rainbow Party before? Did you also come out of it needing a drink in your hand for the next few days? Easy DIY Cake Topper – make an easy cake topper to complement your party theme using just scrapbook paper and stickers! 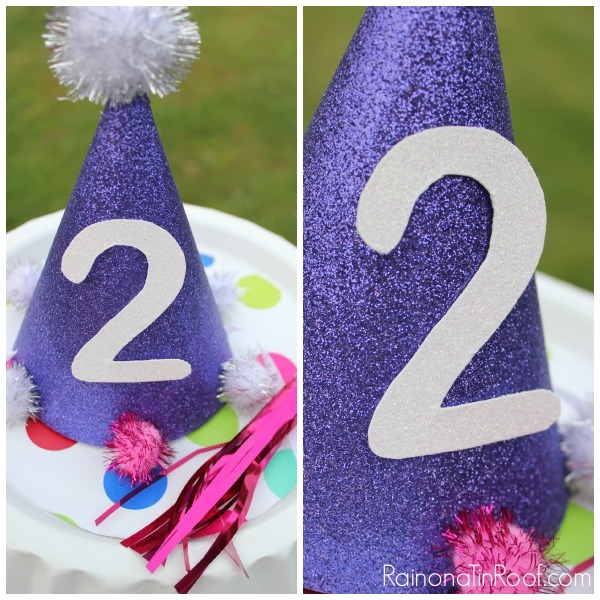 DIY Birthday Party Hat – it will take you all of five minutes and it’s so stinking adorable! Make Your Own Custom Party Invitations – this is so easy and gives the party a great personal touch! So cute, I bet all the little care bears had a good time along with the birthday girl. You worked so hard on the decorations and it paid off. The party was beautiful, you out did yourself. Thanks, Patty! It was a lot of work, but definitely worth it! Are ya sure you weren’t making a political statement at the party? It was a wonderful party! I had a ball and the kid was adorable as always! Great job, Mama! Of course, I was making a political statement! I love this and I love that our littles are taking it back old school! I am currently planning a Strawberry Shortcake party for my Miss Priss Gabi! Although, Strawberry looks a bit different I thought it was cool that she wanted a party with something I used to play with…oh and yes I want to drink for days after my parties! AMEN SISTER! Girl, I LOVED Strawberry Shortcake when I was a kid! I do hate how she looks so different now, but what can ya do?! I just looked at your invitations! So adorable! Can’t wait to see the rest! Thanks, Jennifer! Grunt Labor actually came up with her name. I agreed because it had part of my grandfather’s name in it. 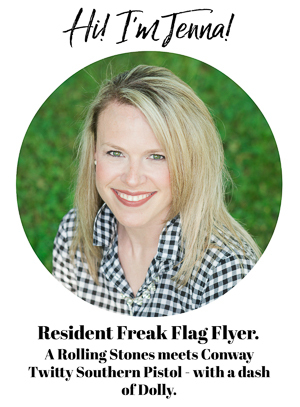 I’m sure she will change her mind a hundred times for her next party theme…. Thanks so much, Sonya! I can’t believe it either!! Adorable! I loved Care Bears as a kid and I love seeing them put again. Too bad my 5 year old isn’t a fan. Maybe I’ll give some to my niece. I can force the love to her, right? She’s not even one, so I need to start before she can tell me no…. I feel like a slacker in the decorating party. 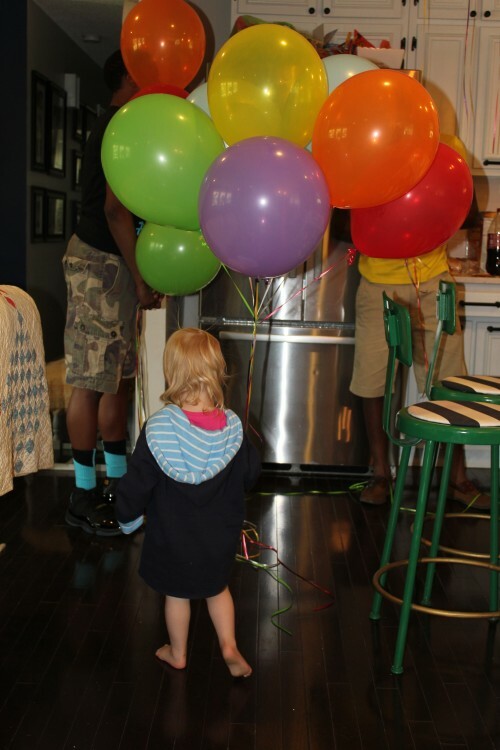 My daughter’s birthday party (last week) didn’t have much… But she didn’t care, she had her balloons too! Megan, you totally aren’t a slacker – you’re a very smart woman for not decorating so much! I’m still recovering over here! Thanks, Jamie! Of course, she only wanted to play with the balloons! Everything looks awesome, Jenna! 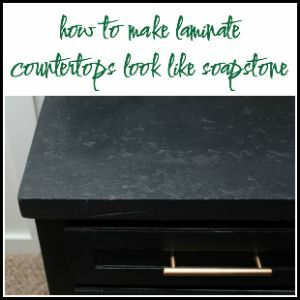 Especially your dining room! You definitely transformed it into Care-a-Lot! And for that, you totally deserve as many beers as you’d like! Thanks, Emily! My thoughts exactly! haha! Wonderful party! I would have sent those balloons on their freedom flight the night after the party. My kids fight over balloons like cray-cray! Thanks, Ashley! I was so over those balloons! Oh my goodness! Hey what a great party idea for kids! 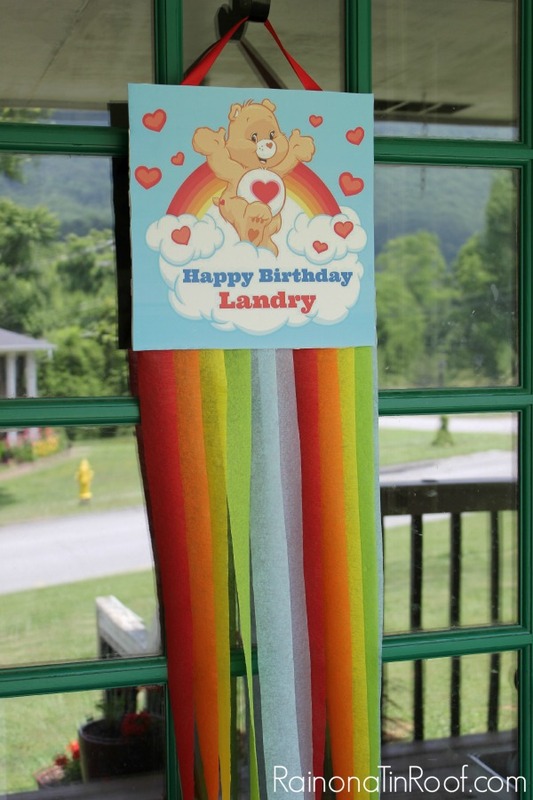 My friends threw me a rainbow surprise party a few years ago (I actually love rainbows!) but most of the décor came from the pride section of the store. The best part? A six layer rainbow cake complete with rainbow sprinkles! Awesome, Nicole! I bet your party was so cool!